increases the feeling of privacy. ARZ Werso, besides the roller shutter qualities has a possibility to set the slats in various positions. In case-there is a need to protect the room interior against the heat and the light, the roller shutter can be pulled down and the slats can be situated horizontally. The roller shutter armour protects against the heat and the light. In case we need to light up the inside of the room we do not have to pull up the roller shutter armour. It is enough to turn the position of the slats around 40% (the same as in Venetian blind) to light up the room interior with natural light and the slats will still protect from heat. The ARZ Werso roller shutter is equipped with built-in sensor of low temperatures which automatically switches off the roller shutter’s venetian blind function in order to protect the mechanism while the roller shutter is covered with ice and snow. There is no way to pull up the roller shutter armour from the outside. It gives additional anti-burglary protection and enhances the feeling of security. The ARZ Werso roller shutter is controlled exclusively by the use of ergonomic radio (wave) remote control.The roller shutter can be operated in every position-it does not matter if the window is closed or opened in a centre pivot or top hung position or even in the cleaning positon. The FAKRO Company is proud to introduce a new external roller shutter system: ARZ Werso. We are the first roof window manufacturer in the world to offer a shutter system which enables the slats to be set in two different positions. When protection against the heat or light is required, the roller shutter should be pulled down with the slats set horizontally. 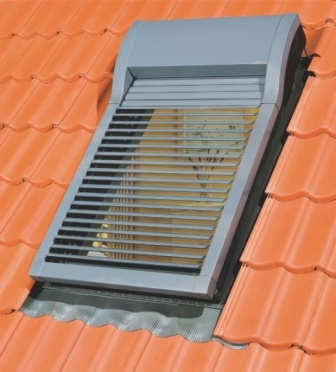 In this position, the shutter’s slats protects against the heat and also blocks out the light. If you want the light to enter the room it is not necessary to roll up the shutter up. All you have to do is to rotate the slats through 40° - it works just like a venetian blind!